Use our exclusive coupon code “ECRUK” to enjoy a 20% discount! When we heard that Apollo discontinued their Endeavour Kit in the UK, we were devastated. They were our personal favourite vape pen, equaling in performance to the V2 Cigs Pro Series vape pen. But, sticking to their innovative ways, Apollo kept up with the ever-improving technological advances of modern society and created a unique vape pen – the Apollo OHM GO kit. Apollo has a stellar track record and thus we were expecting top quality from them. Let’s see how the OHM GO kit held up to our tests. At first glance, the OHM GO’s battery doesn’t seem any different than other high powered batteries on the market, with the exception of its elegant nature. However, Apollo, in its pioneering form, showed off its dominance in the vape pen market. The 1900mAh battery self-adjusts (from 5-50W) based on coil resistance. This new technology astounded us. The device also has micro USB pass-through charging capability and comes with a LED screen that indicates battery charge level. Additionally, it comes with all of the built in safety features including bottom plate vents, short circuit protection, low voltage protection, and overcharge protection. If it wasn’t for vapour volume, this would be the highlight of the OHM GO kit. We have pointed out in both our Apollo brand review and Endeavour kit review that Apollo is all about consistency, especially in regard to vapour volume on all of their kits. From battery power to throat hit to just the right amount of flavouring – Apollo has tweaked their devices to deliver the most consistent and thick vapour volume on the market. This of course applies to the OHM GO kit as well, just as we expected. One thing we would like to point out is that Apollo generally tweaks their devices to offer a more ‘potent’ hit. So, if you are a starter, make sure to start with a mid-range resistance level coil so as not to draw too large of a vapour hit. If you are a heavy vaper though, go all out; this kit is for you. In our Endeavour kit review, we made reference to the fact that there is a learning curve when using a vape pen for the first time. However, Apollo fully took into account usability with the OHM GO kit. The overall threading on this device is awesome. The two-part tank is designed to be easily refillable with no leakage or spills. The all-in-one coils are replaceable within a matter of seconds. The kit comes with a stainless steel Pyrex glass drip tip (which by the way does not transfer heat from your clearomiser). The ‘bottom fill’ feature makes it really easy to fill it up with e-liquid. Simply unscrew it from the bottom and you will see around the shaft where to fill the e-liquid. The OHM GO kit also comes with all of the features to show if you are low on battery or e-juice. This is, by far, one of the easiest vape pens to use. £44.95. When we saw this price we were stunned. The Endeavour kit was £48.95 before our 20% discount through our site. 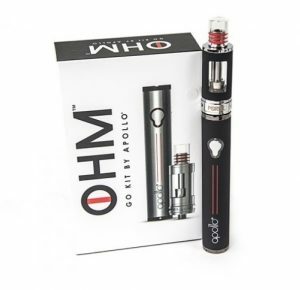 This OHM GO kit is less expensive and it’s unquestionably a more advanced kit all-around. With our 20% discount still applicable, you can purchase this kit for £36 (not including VAT). Couple this with this device’s versatility and it’s not even up for debate; it makes it the best value proposition on the vape pen market! The Apollo customer service is second to none…during the work week. The weekend is more of an issue since they technically do not operate support on Saturdays or Sundays. However, they are still responsive via email over the weekend period. Other than that, Apollo customer support operates Monday-Friday 9AM-5PM via phone or email. Apollo offers a 30-day money back guarantee. They also offer a limited lifetime warranty which covers battery and electronic components only, and is for the product’s lifecycle. That lifecycle generally lasts between 60-180 days. One of the best things about ordering from a renowned company is that you know you are getting good shipping options, which is important when dealing with nicotine deliveries! All orders are sent via Royal Mail and you can track your order in your Apollo account. Though Apollo notes that shipping can take anywhere between 2-7 working days, it generally arrives between 2-3 days. Though the V2 Cigs Pro Series kit is the highest user rated vape pen in the UK, we personally favour the Apollo OHM GO kit due to its innovative and superior form. The battery is powerful and self-adjusts, the vapour volume is the most consistent on the market, and usability is top notch. If you are undecided about which vape pen to buy, the Apollo OHM GO is a good starting point.